The Puosu development is being built by the seashore in Sompasaari, Kalasatama. In Puosu homes you can enjoy the sunny mornings on your balcony, relaxing views of the sea and the Mustikkamaa island. High windows bring the beautiful scenery inside your apartment and fill the rooms with soft natural light. Puosu is a 5–8-storey building, consisting of 43 apartments. The Puosu development is being built by the seashore in Sompasaari, Kalasatama. In Puosu homes you can enjoy the sunny mornings on your balcony, relaxing views of the sea and the Mustikkamaa island. High windows bring the beautiful scenery inside your apartment and fill the rooms with soft natural light. Puosu is a 5–8-storey building, consisting of 43 apartments. Eight of them are stylish loft apartments, which feature high ceilings and a spacious living area combined with a loft-styled sleeping area. There is a sense of space also in the other apartments, and some feature practical solutions such as walk-in-closets. There is a convenient underground car park at the disposal of the residents who have acquired the parking rights. Some of the parking spaces are suitable for charging electric cars. 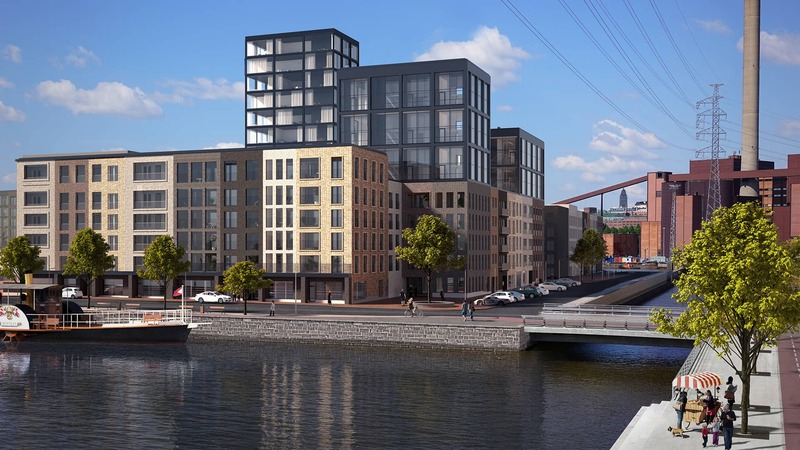 Kalasatama is a trendy new residential area, where you can still feel the atmosphere of the old industrial harbour area. A whole world of restaurants is hidden behind the walls of Teurastamo (the former meatpacking district), and the former power plant of Suvilahti is currently transforming into a centre of culture, art and handicraft. Sompasaari is located directly opposite to Mustikkamaa island, about 10 minutes’ walk south of Kalasatama metro station. Loviseholm park is planned to be built in the middle of Sompasaari, and there will be places for restaurant ships around the shores. The Kruunu bridges are also at the planning stage, and once they are completed, Merihaka and the centre of Helsinki will be only a few tram stops away. In the future Sompasaari will be home to approximately 3000 residents. Learn more about the vivid, urban neighbourhood of Kalasatama. Puosu arpartments will be equipped with a home automation system, allowing you to track your consumption of electricity and water. Hydronic heating system and district cooling will keep the temperatures pleasant all year round. The development will be connected to a waste disposal system, where the waste will go via underground suction tubes to recycling and energy facilities. We have selected an assortment of high quality interior materials to the Puosu apartments. The kitchens are equipped with Bosch appliances, stylish A la Carte kitchen cabinets and attractive stone countertops. Saunas feature a glass wall, and the floors in the living areas are parquet. If you buy early on, you can modify your home according to your personal wishes.